Glenn Beck and Rush Limbaugh believe they are on a mission for their Judeo-Christian God. What exactly is that mission? Evidently, their "God-duh," as Limbaugh would say, wants them to convince the United States Congress to extend the tax cuts for the wealthiest Americans indefinitely. Not only do they have "God-duh" on their side, but they also have "JeeeeeSUS," as Limbaugh would say, on their side too. I like to call these two clowns, who both have Messiah complexes, Frickus and Frackus. They both argue that Jesus Christ, based on their understanding of Biblical mythology, would approve of this tax cut for the wealthiest Americans. Well, they don't actually make that precisely worded assertion, but, through cleverly cloaked, comparative associations, they make that case incessantly. Believe it, or not, this story begins with a discussion of a recent study about the dangers of smoking cigarettes. Hang on to your seats and try to follow and keep up with these elaborate, convoluted, labyrinthine associations of Frickus and Frackus. On December 9, 2009, Rush Limbaugh did his standard, cookie-cutter rant against the "Nanny State" because of a new study released by the U.S. Surgeon General. You can read Limbaugh's rant, titled "Just One Puff Can Kill You?" on his website. A little later in the show Frickus segues into the tax cuts for the rich legislation. You can also read that entire convoluted mess at Limbaugh's site in a segment that he titled, " Obama Sets Himself Up to Win No Matter What Happens to Economy." "You know, this goes back to this smoking business. I read the e-mail during the break. 'Why do you keep making a big deal about smoking?' Let me tell you why. I remember back in the old days when you could smoke in restaurants, and so do you. Do you remember all the dead people you had to climb over when you left, who had died from your secondhand smoke? You remember that? Oh, I do! Man, I'd light a cigar, smoke it halfway, and people were dropping like flies! In 21, when I left, I had to climb over 'em to get out of there. They were dying that fast. 'Come on, Rush. Stop making jokes.' I'm not making a joke. I'm telling you what your regime is saying." Gee, I must have missed the finding in that study that concluded people were "dropping like flies" from "one puff" of "secondhand smoke." So far, in this mess, we have, via sarcasm from Professor Frickus. . . That study is absurd, therefore, Libs lie. "Now, if you've got a regime that will lie like this -- one puff of one cigarette or secondhand cigarette smoke can cause a bystander to have a heart attack, if they'll say that -- they have no credibility as far as I'm concerned. Well, they never have had with me, but for people still holding out hope, this is no different than some of the scare things they've been saying about global warming. It's all BS. These people on the left -- I don't care if it's Obama, I don't care who it is -- they lie through their teeth. 'Mr. Limbaugh, they care about people. You're just misunderstanding.' No, I live in Literalville. When a politician says something, I hold 'em to it." "Literalville"? Nah. Rush lives in Loonyville. Unfortunately for Rush, even his zombie like "Dittoheads" weren't buying this load of BS. ". . .This is no different than some of the scare things they've been saying about global warming." Which, now, gives us the combined associative wisdom, from Professor Frickus, that. . . That study is absurd, therefore, Libs lie. Just like with their global warming BS. From there, Rush mockingly references some emails from fans complaining that his "dropping like flies" analogy is a bit "over the top." I know it's silly, just as it is silly that you wanna believe it. I mean, you've gotta believe that happened if you're gonna believe your regime. Well, the same thing here with this tax plan. He doesn't believe any of this, and I think it's time to say so. If they'll lie about something as serious as a stroke, or as serious as a heart attack, then lying about this tax business is nothing. I mean, this is chump change." Which gives us the final, combined associative wisdom from Professor Frickus that. . . That study is absurd, therefore, Libs lie. Just like with their global warming BS,. and.... just like their no tax cuts for me, er... the rich, er... the job creators. Here is the most important line from Limbaugh's entire cockamamie diatribe. "So whoever is careless with small things, you can trust that they're lying to you on the big stuff as well." Bingo! That statement, is the singular truth in that entire segment. The problem for Professor Frickus is that it's the perfect example of "Freudian projection." For more than a year, during 2009, Limbaugh was "careless about the small things." That "small thing" was the year-long cover-up of how he really lost weight during 2009. You can read about that controversy, and my speculations about how Limbaugh might really have lost that weight, in my expose titled, "Rush Limbaugh's Evil Fix for Childhood Obesity in America: Twinkies and Camels." What you will find is that Limbaugh lied about the "small things" constantly, incessantly, for a full year about his "It's not a ruse! It's not a ruse! It's not a ruse! ", diet. Which, according to his own argument, means that "you can trust that [Limbaugh is] lying to you on the big stuff as well." What's the big stuff? The "big stuff" is the Declaration of Independence; the Constitution; the Founding Fathers; Nature's God and the Laws of Nature; separation of Church and State; global climate change; Liberalism is communism; and. . .Tax cuts for the rich are a good thing for America. How is it all tied in to a "Holy Crusade"? Easy, Frickus the Messiah, with "talent on loan from God-duh," has yet another cookie cutter mantra that is pure unadulterated prevarication. On November 29, 2009, and he used it again just last week with a caller in a segment titled, "Moderate Democrats" are a Myth". "The Constitution is an obstacle to them [Liberals]; it's the Bible to me. And I don't know about you; I don't compromise on the Bible. And I don't compromise on the Constitution. So to me the solution to this is they must be beaten, politically, they must be beaten. And then you, as a moderate Democrat, have to learn that there's no such thing as a moderate Democrat. If you're a Democrat of any kind, you're a Democrat. If you vote Democrat you're voting liberal in any constitution, you have to be beaten, too." You don't have to look any further than Limbaugh's keynote address at the 2009 Conservative Political Action Conference (CPAC) to understand Limbaugh's idiocy when it comes to the Constitution. "We want every American to be the best he or she chooses to be. We recognize that we are all individuals. We love and revere our founding documents, the Constitution and the Declaration of Independence. We believe that the preamble to the Constitution contains an inarguable truth that we are all endowed by our creator with certain inalienable rights, among them Life, Liberty, Freedom, and the pursuit of Happiness. Those of you watching at home may wonder why this is being applauded. We conservatives think all three are under assault. Thank you. Thank you." Your average 7th grader knows that those words are from the Declaration of Independence, not the Constitution. Hilariously, Limbaugh was there at CPAC, not just to deliver the keynote address, but to also (for crying out loud) accept CPAC's 2009 "Defender of the Constitution" award. You can read the entire speech at Limbaugh's website. He has cleverly titled the lie fest "Rush's First Televised Address to the Nation: Conservative Political Action Conference (CPAC) Speech." You can watch the full video there, as well. It's a good gut busting belly laugh for anyone intelligent enough not to be a "Dittohead." Many people speculate that it was Keith Olbermann's criticism of Limbaugh's bouncy-bouncy, gargantuan performance at CPAC that led Limbaugh to invent his "It's not a ruse! It's not a ruse! It's not a ruse" 2009 diet ruse. Let's look at the "Holy Crusade" part of all this. "Now, as I mentioned yesterday, I pray to Jesus Christ often. I have read and studied the Gospels. I know Jesus Christ. It would never occur to me to refer to Jesus Christ as an agent for change." Oh, really Rush? So you think that Jesus Christ would be totally opposed to putting an end to this whole "narrowing the gap between the rich and the poor" thing, is that right?" Now, a lot of people misunderstand all this, but the Golden Rule doesn't come from Christianity, and Cain and Abel is not 'I'm going to take care of my brother and I'm going to take care of my sister,' and Jesus Christ has nothing to do with either one of them." See? Not only was Jesus against change, he didn't think very highly of all that "social justice" stuff that Limbaugh's bud Frackus, aka Glenn Beck, is constantly bellyaching about. I wonder if, somehow, Frickus can make the case that Jesus would be a conservative, like himself, and that Jesus would also hate socialism and those evil global warming wackos? "I'm getting a lot of e-mails that the Golden Rule is in the Old Testament, that it's in the New Testament, but it's the Code of Hammurabi, an eye for an eye, a tooth for a tooth, do unto others. But the point is, I am my brother's keeper. There is an effort -- the reason why this is important, there's an effort by the left to say that Jesus was a socialist, and they are using this to turn many evangelical people into global warming people. We are the stewards of the planet and so forth." Yep. No problem. And it only took Limbaugh the Messiah four sentences. Frickus' powers of convoluted associations, knows no bounds. News Alert: In the December 10 Rush Limbaugh Show, the Maha Rushie covered Charles Krauthammer's Washington Post Op-Ed, titled "Swindle of the year," in which Mr. Krauthammer attempts to convince the Democratic Party that it is missing out on a good deal, and they should want to pass the tax-cut legislation, as is. Pull the other leg, Charles! Limbaugh only mildly disagreed with Krauthammer's piece. He wants to kick the can down the road into the new, 2010 Lame Duck House of Representatives. It's the same scam, in a different suit. The Maha Rushie wants the Democratic Party to think that they had better pass it now, as is, or they're going to get the Lame Duck version. Don't fall for it Democratic Congress. Here's what you should do. House: Strip the tax cuts for people earning more than $250,000 back out of the Bill. Submit it to the Senate every day, between now and December 31, 2010. Senate: Be like Bernie Sanders. Filibuster. Make it historic. Take it all the way through the holidays right up to midnight on December 31. If you want to spend the holidays with your families, bring them to D.C. You can run shifts. Do what Jesus would do. Turn the tables over on the money-changers and kick this can full of tax-cut crapola down the road to the Lame Duck House. Let the GOP get credit for this plutocratic pile of poo. If, after reading this piece, you think that no one else could possibly be as loopy of a "Messiah want-to-be" as Limbaugh, then you're in for an amusing surprise. Frackus, aka Glenn Beck, is every bit as loopy; Maybe even more so. 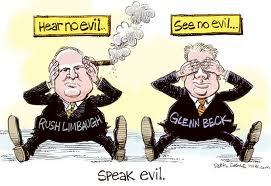 Next up: "Limbaugh and Beck's Holy Crusade for Tax Cuts for the Wealthy, Part 2: Frackus" (coming soon).